Most kids dream of being athletes, not coaches. So then does why does everyone want to be a manager rather than the talent in the biz world? There is a fine line in life when it comes to juxtapositions. On one side of the line is genuine profundity, and on the other side is schmaltzy non sequitur and/or demagoguery. And I’d argue that the line is not entirely subjective, as it might seem. There is a Tupac Shakur lyric that is sort of raw and powerful that says, “they’ve got money for wars but can’t feed the poor.” If you’re a bleeding heart type, you’ll probably agree wholeheartedly. If you’re more of a pragmatist, you might say, “well, there are degrees of poverty and need, and what good is feeding people if some foreign entity is lobbing cruise missiles at them?” But you have to admit that he’s comparing apples to apples, so to speak. There is some finite pool of money, and some of that money is being spent on blowing one another up instead of feeding people that are hungry. On the other side of this line of juxtaposition lie tiresome canards like “they can send a man to the moon but they can’t make a computer that doesn’t crash?! ?” Yeah, because those are the same engineering problem. Or how about “a country can’t run a fiscal deficit because I don’t run my own budget that way at home with the groceries and the car payments!” Right, because macroeconomics is like your budget spreadsheet. And you also have the ability to print money to pay off your debts. Back to the tweet. I think it sits right on the juxtaposition line. On the one hand, it seems to be sort of garden-variety line-employee populism (“pointy-haired bosses bad, knowledge workers good”) that ignores an important difference between athlete-coach and employee-manager — namely the inverted money and fame related power dynamic of athletes and coaches as compared to line employees and managers. LeBron James, not Erik Spoelstra, puts butts in seats and gets paid a king’s ransom, even if Spoelstra does theoretically call the shots. But it does raise an interesting question that isn’t the one that’s literally being asked (the answer to the tweet’s question being easy: managers make more money, have offices and get to boss people around). The interesting question that is raised is “why are line managers and other overhead personnel overvalued?” Let me say here that I’m not going to spend this post talking in much detail about that. I poured a lot of time and thought into it for the concluding part of my Expert Beginner E-Book, so I’ll summarize here by saying that there is a bit of a societal pyramid scheme that occurs when it comes to work. We collectively agree on a system where 20-somethings that are new to the workforce do all the grunt work for little pay and that, over the course of our careers, we accumulate vacation time, bigger salaries, larger desks and offices, and the ‘right’ to tell others what to do rather than doing it ourselves. We pat ourselves on the back for ‘earning’ it, but often that assessment is pretty questionable. It’s more a matter of waiting our turn. Managers are overvalued in organizations because of a collective endorsement of the same kind of reasoning that drives social security — disproportionate dues paying now, followed by disproportionate dues receiving later. The entry level folks tolerate overvalued mid-level management either because they have no choice or because they someday want to be that overvalued mid-level management which is, of course, a fairly sweet deal once you get into the club. But the overvaluation of management goes deeper than that and finds its real roots in the undervaluation of non-management. In other words, if the Product X Team, consisting of five knowledge workers and a line manager, delivers a spectacular and wildly profitable success, is this owed to the team or to the manager? I’d say that, in a very real way, this is comparable to sports teams in that a good manager will account for some variance and some wins here and there by managing egos, strategizing and motivating, but at the end of the day no one is going to manage a hopelessly underqualified team into serious contention. But, unlike sports teams, the spotlight in the corporate world often falls onto the manager because the manager is in a position to seize it and because it’s simply easier to give credit to the “leader” than to parcel it out in equal portions to the team. So why do young athletes aspire to be LeBron James and not Eric Spoelstra while young academics want to be the boss rather than the inventor? Because Steve Jobs. Because Warren Buffet. Because bosses, like athletes, represent the competitive pinnacle. It’s really the same thing in the end — a desire to dominate. Athletes, CEOs and, to a lesser extent, line managers, have gotten to where they are by defeating foes in direct competition, and that’s appealing to children in an environment where peer competition is natural and amplified (grade school). The overvaluation of managers (and athletes, actually) is a zero-sum outlook on the world. You become a success by competing against others and causing them to fail. There are winners and losers and the glory lies in being a winner in this game. But there is another avenue, which is that taken by who I’d call the Inventor or the Maker — the positive sum player. Makers (and I use this umbrella to describe the overwhelming majority of line-level programmers as well as engineers and other people who produce work product) shine by making the world a better place for all. They transmute their creativity and ambition into products and services that improve the standard of living and better people’s lives. There doesn’t need to be a loser in this game for the Maker to be a winner. Make no mistake — there is certainly competition among Makers. But it is a healthy, positive sum competition. They compete against one another and themselves to invent great things, to do it quickly, and to do it well. I may want to be the best programmer on earth and that desire may drive me to some late nights hitting the books and cranking out code, but I can produce helpful things without “defeating” some other programmer in some kind of game or competition for position. The interplay between Makers and what I’ll call Competitors has historically been an uneasy balance. In the time before widespread knowledge workers in corporations, you had the mad-scientist/inventor archetype as your Makers: the Edisons and Teslas of the world. Then with the technological growth of the 20th century, the Makers were kind of funneled into working as Organization Man where they went from being valued professionals in the 50s to eventually being Dilbert in more recent times — toiling under the inept stewardship of a pointy haired boss that also happened to be a marginally victorious Competitor. Makers were in a difficult position, as they really just wanted to make. Working your way up the corporate ladder as Competitor requires stopping Making and engaging in zero sum gamesmanship that doesn’t interest that archetype, but not doing so meant obeying the micromanaging and often incompetent Competitors and having the fun sucked out of the act of making. Finding organizations that got this right has become so rare that places like Valve and Github are the stuff of legends. Historically, Makers could try going off on their own, but that meant giving up a lot of the Making as well, since they’d then have to worry about their own sales, marketing, accounting, etc. But the Makers are going to have the last laugh. Flush with opportunities, developer job hopping is accelerating rapidly. Companies are ceasing to bother with asking developers why their resumes feature so much job hopping — they’re so hard up for programmers that they don’t bother to ask. More and more, developers are seizing on any excuse or any annoyance to fly the coop and go work on something else. This might be organizational stupidities, but it also might simply be something like “I’m tired of C# and want to try out Ruby for a while.” The mobility within the job market for developers is pretty much unprecedented for a Maker position. In fact, it’s starting to look a lot more like another type of profession that is also not zero sum: high skill jobs for which there is virtually inelastic demand. Two that come to mind are doctors and lawyers. As long as the world has sick people it needs doctors, and as long as there are disputes (and lawyers making laws requiring lawyers for things), it needs lawyers (at least until the automation juggernaut automates both of these professions — I put an upper bound of 50 years on the full automation of the medical profession making human doctors obsolete). Both doctors and lawyers have a different sort of work model than most Competitors and Makers. They get a lot of education and then they start their own practices, band together in small groups, or join a large existing practice. But whichever option they choose, their affiliations tend to be very fluid and their ability to work for themselves almost a given, if they so choose. I think the handwriting is on the wall for the future of software development. I think that we’re careening toward a future where developers working for corporations for any length of time is such an anachronism that it isn’t considered a serious possibility. Developers aren’t going to job hop at all because they won’t have traditional corporate jobs. 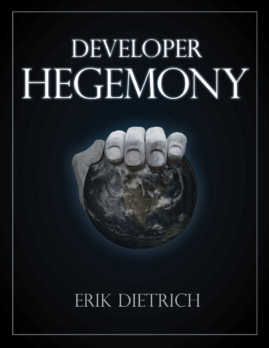 Due to increased globalization, networking, and interconnectivity, developers have sort of a de facto guild — their association with the global network of developers. Promotion, marketing, sales, and even some other aspects of managing one’s own consultancies are collectivized to a degree as developers have a network of friends to help them with such things. They often become moot points because who needs to bother with sales and marketing when business is banging down your door already? love that bit, spot on.